Thai arrived at IPPL on May 13, 2013 along with his big sister Kendra and parents Gary and Glenda. The four of them came to us when the Silver Springs, Florida tourist attraction where Thai was born was being closed: the facility was disbanding its exotic animal collection, and the site was being turned into a State Park/event venue. Thai came to us with the nickname of “Buddha Boy” and a great big Buddha belly to go with it! 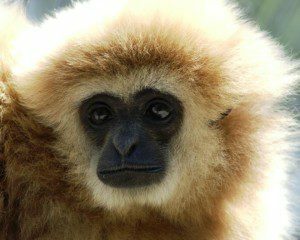 He weighed about 29 pounds, which is a lot for a gibbon and much more than his petite father who was half his size. He came with a taste for treats and a reputed fondness for being hand-fed. Fortunately he has slimmed down quite a bit since his arrival and has taken a liking to the healthy diets we feed our gibbons. Even though Thai had been housed near a Kodiak bear at the tourist site, he does not seem to approve of large mammals and Snow, our rescued Great Pyrenees, bears the brunt of his dislike. Although alert to “intruders” (Fed Ex delivery vans, etc. ), Snow is always well behaved towards our gibbons. However, Thai regularly makes alarm calls at Snow to let everyone know she shouldn’t be there. The only time he doesn’t alarm at her is when she walks around with the animal care staff as they pass out food. Thai is so focused on his next meal he doesn’t even notice that Snow is there.